The RoboCup Humanoid Kidsize League has rocketed into an exceptionally competitive league, supported by recent introduction of the open source hardware and software platforms. Teams must improve substantially their robot teams every year to stay competitive. 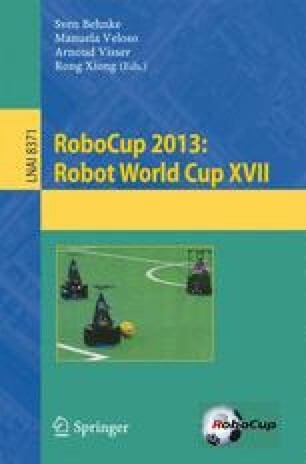 In addition to the important skills of walking speed, kick stability, and visual acuity, the 2013 season introduced rule changes to test robot intelligence – and team adaptability. In this paper, Team DARwIn, the winning team of the Humanoid Kidsize League, presents its crucial improvements of its robotic platform and soccer system to mitigate risks from same colored goal posts, substitutions and noise in goalkeeper ball estimates.